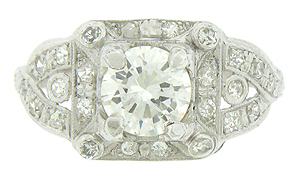 This exquisite antique engagement ring features a .86 carat, GIA certified, G color, Vs1 clarity round diamond. The dazzling center stone is surrounded by a square frame of additional fine faceted diamonds. 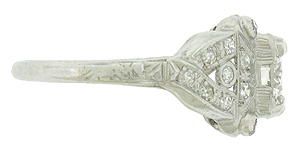 The shank of the ring separates to a pair of diamond frosted vines stretching up to present the center mounting, while single bezel set diamonds float inside the open shoulders. 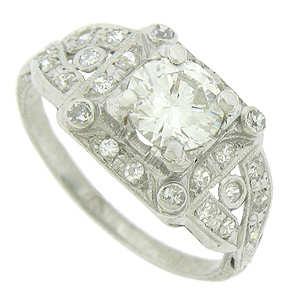 Excluding the center stone, the mounting is set with an additional .40 carat of diamonds. 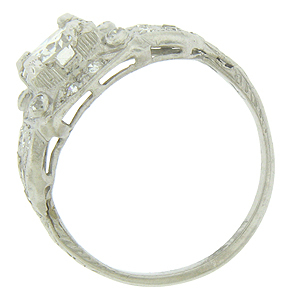 The ring measures 9.83 mm in width. Circa: 1920. Size 5 1/4. We can re-size.